William Hope Hodgson received several reviews during his lifetime and, for the most part, they are all favorable. THE NIGHT LAND was reviewed at least 5 times in 1912 and virtually all of his books were reviewed at least once. The majorty of these appeared in THE BOOKMAN and other literary publications such as THE TIMES LITERARY SUPPLEMENT. Most of these early reviews are unsigned which is not unusual for the time. It does bring up the possibility that these reviews could have been written by Hodgson himself (much in the same way his PR articles were) but there is nothing to verify or deny this. 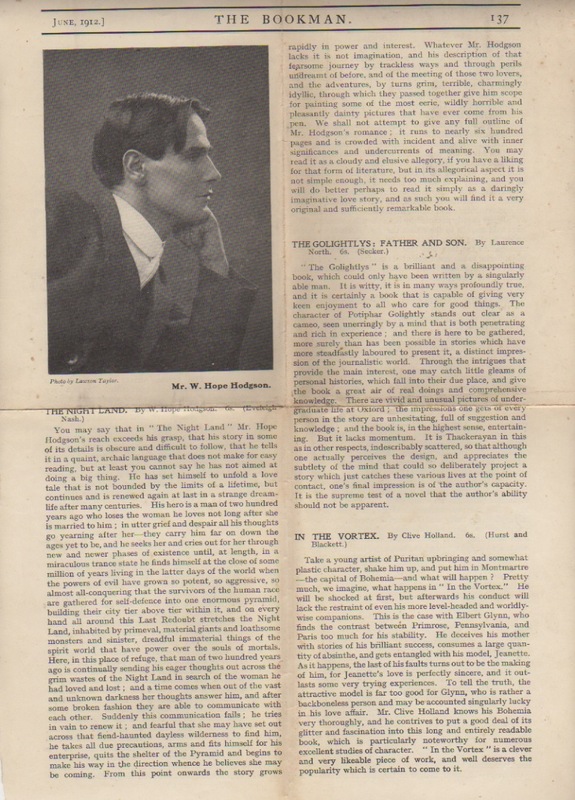 THE BOOKMAN was a monthly magazine published in London from 1891-1934 by Hodder and Stoughton and was a cataloge that showed their current publications as well as reviews, advertising and illustrations. It was also edited by Arthur St. John Adcock who was a great friend of WHH and probably responsible for these reviews. You may say that in “The Night Land” Mr. Hope Hodgson’s reach exceeds his grasp, that his story in some of its details is obscure and difficult to follow, that he tells it in a quaint, archaic language that does not make for easy reading, but at least you cannot say he has not aimed at doing a big thing. He has set himself to unfold a love tale that is not bounded by the limits of a lifetime, but continues and is renewed again at last in a strange dream-life after many centuries. His her is a man of two hundred years ago who loses the woman he loves not long after she is married to him; in utter grief and despair all his thoughts go yearning after her—they carry him far on down the ages yet to be, and he seeks her and cries out for her through new and newer phases of existence until, at length, in a miraculous trans state he finds himself at the close of some millions of years living in the latter days of the world when the powers of evil have grown so potent, so aggressive, so almost all-conquering that the survivors of the human race are gathered for self-defence into one enormous pyramid, building their city tier above their within it, and on every hand all around this Last Redoubt stretches the Night Land, inhabited by primeval, material giants and loathsome monsters and sinister, dreadful immaterial things of the spirit world that have power over the souls of mortals. Here, in this place of refuge, that man of two hundred years ago is continually sending his eager thoughts out across the grim wastes of the Night Land in search of the woman he had loved and lost; and a time comes when out of the vast and unknown darkness her thoughts answer him, and after some broken fashion they are able to communicate with each other. Suddenly this communication fails; he tries in vain to renew it; and fearful that she may have set out across that fiend-haunted dayless wilderness to find him, he takes all due precautions, arms and fits himself for his enterprise, quits the shelter of the Pyramid and begins to make his way in the direction whence he believes she may be coming. From this point onwards the story grows rapidly in power and interest. Whatever Mr. Hodgson lacks it is not imagination, and his description of that fearsome journey by trackless ways and through perils undreamt of before, and of the meeting of those two lovers, and the adventures, by turns grim, terrible, charmingly idyllic, through which they passed together give him scope for painting some of the most eerie, wildly horrible and pleasantly dainty pictures that have ever come from his pen. We shall not attempt to give any full outline of Mr. Hodgson’s romance; it runs to nearly six hundred pages and is crowded with incident and alive with inner significances and undercurrents of meaning. You may read it as a cloudy and elusive allegory, if you have a liking for that sort of literature, but in its allegorical aspect it is not simple enough, it needs too much explaining, and you will do better perhaps to read it simply as a daringly imaginative love story, and as such you will find it a very original and sufficiently remarkable book. A very good review. I suspect most consider _The House on the Borderland_ to be his best, my favorite has always been _The Night Land_. While it is a love story, it is not a completely idyllic one, especially if one considers the behavior of the two on the trip back to The Last Redoubt. I really do not understand what made mr. Hodgson reiterate himself so often in the second part of the book but sometimes it seems to me that all the chapters after finding Naani were written by an adolescent who knows nothing about the relation of the sexes, so I really think there is something about the theory that WHH wrote (at least some of it) The Night Land earlier when being a young boy. I must admit I had troubles understanding some of the turns of the phrases in the opening chapters but gradually I got acustomed to the pseudo-archaism and when I was in the fourth or fifth chapter I comprehended virtually everything, but what I really hated about the book was the constant repetition on WHH’s part I have mentioned above; that’s why my reading of the Night Land took me more than a year. The slow progress, the irrational behaviour of the two main characters, the stupid repetition of incidents and whole sentences used many a time before, all these factors combined to prompt me to put the strange literal piece down to be read when my mood to brave its pitfalls and snares has been back. For my money The Night Land belongs among the literal pieces of its times which have great concept, great atmosphere but the second part drags them down to a slight dissapointment on the reader’s part. I can mention two other examples, The Purple Cloud (1901) by M.P.Shiel which absolutly stunning till the character starts to destroy the cities of world, and Out Of The Silence (1913) by Erle Cox about a man discovering an enormous underground spheric capsule containing the knowledge and mechanic instruments and machinery of some immemorial race that inhabited the Earth before the advetnt of Man (hello mr Lovecraft; wonder if you ever read this story ) which has great atmosphere of suspense till the main character finds some members of the race still alive. I agree with you about the second half becoming falling apart (until that awesome climatic race back to the Redoubt; now THAT’S a finale!). In 2010, James Stoddard published a rewrite called “The Night Land: A Story Retold” (which did away with the Pseudo-17th-Century English, instead opting for early-20th-century English); I read it last year. In a way, the two versions compliment each other. The original, in spite of its intimidating prose, had certain powerful, almost-lyrical passages that Stoddard’s version, even at its best, just can’t match; Stoddard’s version, however, keeps everything that was great about the original (the world, the monsters, the well-paced action sequences, etc. ), completely – in my opinion, anyway – fixes the second half, and gives the two leads more-detailed characterizations. Since you say you liked the concept of the novel, but were disappointed by its execution, you might want to go to Amazon and give Stoddard’s version a try. It helped me better-appreciate Hodgson’s vision, and it might do the same for you. Thanks for posting this. Nice to see some rarely used images along with the article.